Over concerns of vasoconstriction leading to free flap failure, for decades, it has been a common practice to avoid vasopressors for the maintenance of blood pressure during reconstructive microvascular surgeries. As perfusion across the microvascular anastamoses is mainly dependent on the blood pressure, any degree of hypotension could be detrimental in these cases. It has been postulated that maintenance of blood pressure with volume expansion, with the added advantage of hemodilution, improves perfusion and thereby the flap outcome. There are conflicting reports regarding the effect of vasopressors on denervated flaps. It is now thought that use of vasoconstrictors for the maintenance of blood pressure could actually be advantageous in view of improved perfusion rather than the yet to be proven concerns over possible vasoconstriction. The primary objective of this retrospective analysis was to assess the impact of use of noradrenaline in the perioperative period on outcome of free flaps in patients who underwent microvasular reconstructive surgeries as compared to those who did not receive noradrenaline. The secondary objectives included studying the effect of compounding factors such as intraoperative hypothermia and intraoperative use of various intravenous fluids used to correct hypotension, on the flap outcome. Following the Institutional Ethical Committee clearance, this retrospective study was conducted in the Head and Neck Surgical Division of a Tertiary Care Center. Perioperative data of 120 patients who had undergone free flap reconstructive surgeries between January 2016 and December 2016 were retrospectively analyzed. The patients had undergone wide local excision of carcinoma of buccal mucosa, floor of mouth, tongue, mandible, maxilla, thyroid, tonsil, and larynx. Flaps harvested to cover the surgical defects included radial forearm, anterolateral thigh, and the latissimus dorsi myocutaneous free flaps as well as free fibula osteocutaneous free flap. 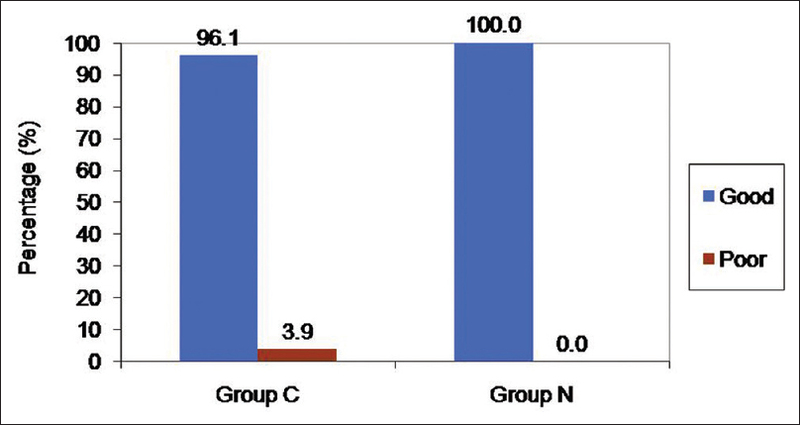 Among the 120 patients, 102 who did not require noradrenaline for maintenance of blood pressure intraoperatively formed the control group (Group C), whereas 18 patients who required noradrenaline infusion constituted the study group (Group N). Patients who had received vasopressors other than noradrenaline and those required multiple agents to maintain blood pressure were not included in the present study. Continuous consecutive sampling was done; all cases in fulfillment of the defined inclusion criteria during the study period were included in the study population. All patients had a preoperative Doppler done on donor vessel site to confirm patency. Papaverine was used as vasodilator in the recipient vessel for all patients during flap anastomosis. All patients received low-molecular-weight heparin postoperatively. The flap monitoring was done by Doppler, flap skin bleeding on pin prick and color. Patients were extubated or weaned from ventilator if tracheostomized after confirmation of flap viability. Hypotension in the perioperative period (mean arterial pressure [MAP] <65 mm hg) was managed initially with crystalloids, colloids, and packed red cells, if haemoglobin was <8 g/dL, and noradrenaline infusion varying from 0.02 to 2 μg/kg/min as required. Agents such as adrenaline, dobutamine, and vasopressin were added as indicated as per individual patient requirements, if other measures failed to maintain blood pressure (MAP <65 mm hg). Patients who had received vasopressors other than noradrenaline and those required multiple agents to maintain blood pressure were not included in the present study. 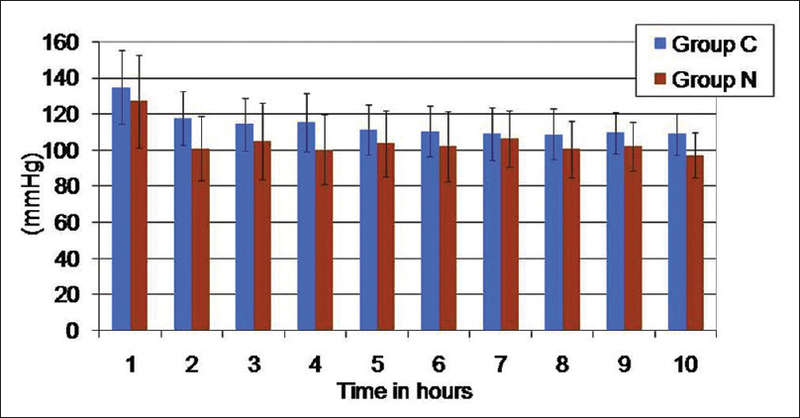 Data including preoperative and postoperative hemoglobin, urea, creatinine, sodium and potassium levels, intraoperative blood pressures, heart rate, urine output, and temperature at hourly intervals were also documented. The final flap outcome at discharge from hospital was noted. Data were collected using a pro forma designed specifically for the purpose of this study. 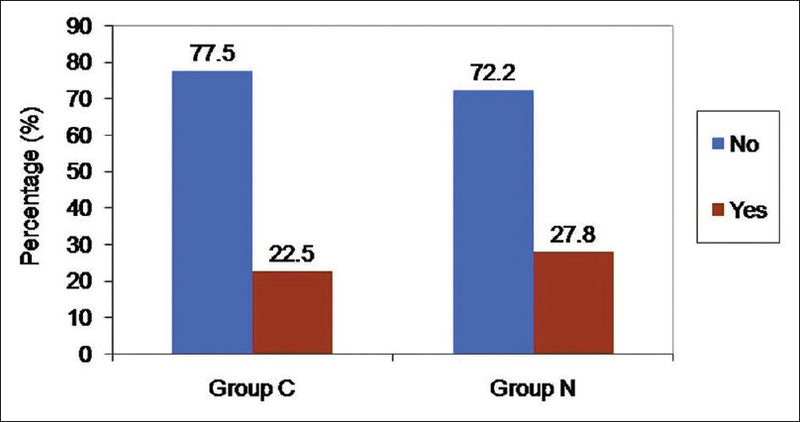 Chi-square test was used to compare gender, units of fresh frozen plasma consumed, and flap outcome among N and V groups. The Mann–Whitney test or independent sample t-test was used to compare volume of packed cells used, demographic continuous variables, hemodynamic variables, temperature and urine output. Paired t-test was used to compare the pre- and post-operative blood test values in each group. Statistical analysis was performed using IBM SPSS Statistics 20 Windows (SPSS Inc., Chicago, USA). Both groups did not have any significant difference in demographical variables of age, height, and weight [Table 1]. Out of 120 patients, 15% (n = 18) patients required noradrenaline for hemodynamic support (Group N). In Group N, 38.9% (n = 7) and 10.8% (n = 11) in Group C were of the American Society of Anesthesiologists (ASA) physical status three classification. In Group N, 27.78% (n = 5) patients had to be re-explored [Figure 1]. The mean time of re-exploration in Group N and Group C were comparable (7.1 ± 8.8 vs. 9.2 ± 12.8 h, P = 0.357). Out of the five patients, four patients were re-explored once and one patient twice. In Group C, 22.55% (n = 23) had to be re-explored, 21 patients once and 2 patients had to be re-explored twice. Four patients in Group C and none in Group N had a poor flap outcome (3.92% vs. 0%), i.e. 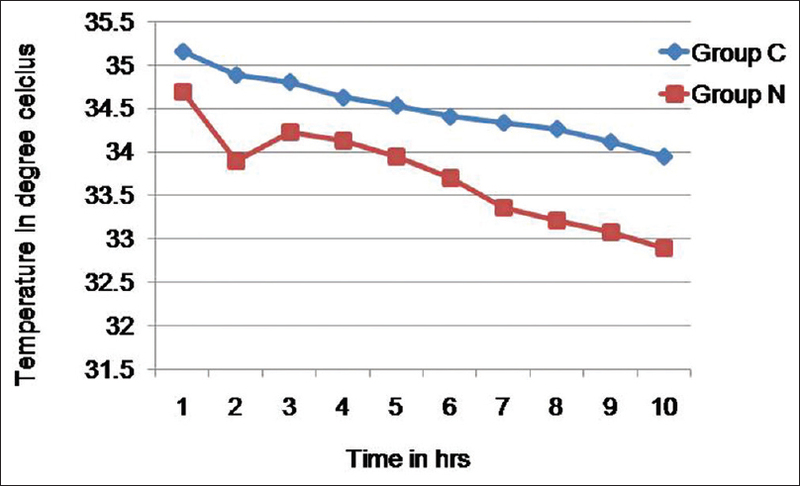 loss of flap at time of discharge from hospital [Figure 2]. There was no significant difference in surgical duration and volume of crystalloids received by patients in both groups [Table 2]. Preoperative hemoglobin and sodium levels were significantly lower in Group N (P = 0.05). 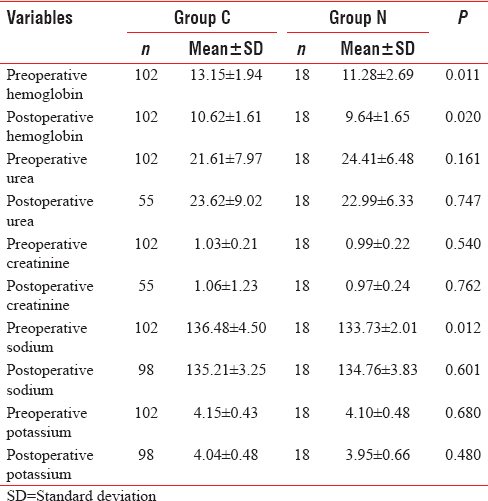 Postoperative hemoglobin, pre- and post-operative urea, creatinine, serum potassium, and postoperative sodium levels were comparable [Table 3]. However, the percentage reduction in hemoglobin concentration from pre-operative to post-operative level in Group N and Group C was comparable (−18.14% ± 13.58% vs. −11.04% ± 21.25%, P = 0.065). There was significant difference in temperature throughout intraoperatively with Group N patients being more hypothermic [Figure 3]. Patients in Group C had higher systolic blood pressure in the beginning. 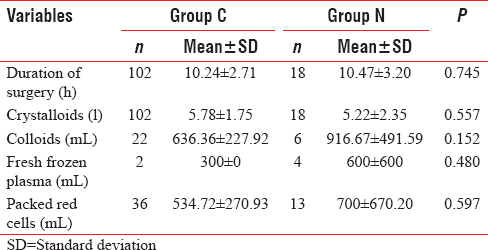 Systolic blood pressure in Group N was found to be significantly lower at 2, 4, 5, 6, 8, 9, and 10 h of surgery with no significant difference in heart rate or urine output [Figure 4] and [Figure 5]. About 21.6% of patients in Group C received one or more colloids, whereas it was 33.3% of patients in Group N. The amount of packed red cells transfused was higher in Group N, with higher number of fresh frozen plasma units [Table 2]. In the present study, reasons for re-explorations in Group C included venous thrombosis (22%), venous congestion (19%), poor arterial flow due to thrombus (17%), spasm (8%), compression by hematoma (31%), and mechanical kinking of vessels (3%). In Group N, venous thrombus and congestion were the cause of re-exploration in 56% of patients, arterial thrombus, and inadequate arterial flow in 28% and rest of patients had hematoma compressing the vessels. 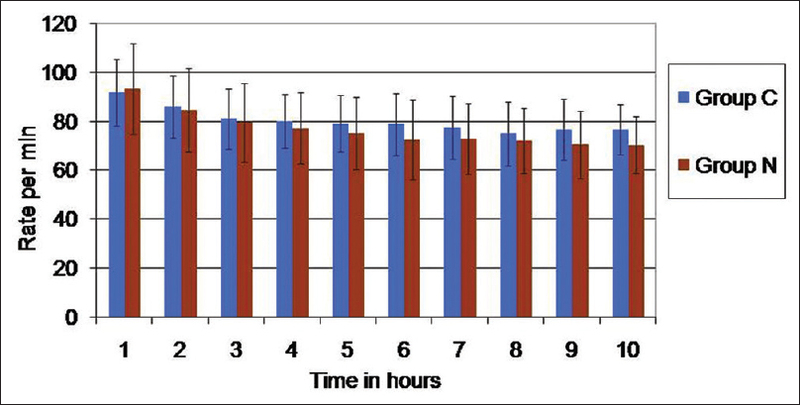 The mean duration of noradrenaline administration was 9.23 ± 4.37 h and dose used ranged from 0.02 to 2 μg/kg/min at various time points. This retrospective analysis of 120 patients who underwent free flap reconstructive surgeries over 1 year had shown that though intraoperative use of noradrenaline resulted in marginally higher incidence of re-exploration, the final flap survival was unaffected when it was used for the maintenance of blood pressure. Surgical excision of cancer of the head and neck often leaves an undesirable defect which requires reconstruction with free flaps. The harvested free flaps have recipient vessels which are anastomosed to donor vessels at the defect. Flow across anastomoses depends on blood viscosity and perfusion pressure. Adrenergic innervation of vasculature causes vasoconstriction of arterioles and precapillary sphincters in response to sympathetic stimulation. Transplanted recipient vessels are denervated and are questionably still believed to vasoconstriction sympathetic stimulation. General anesthesia per se causes increase in blood viscosity, red cell aggregation, fibrinogen, clotting factors, platelet aggregation and adhesion, and impaired fibrinolysis and hence leads to impaired perfusion in microcirculation. Maintaining an adequate MAP and cardiac output is crucial. Urine output is an indicator of vascular filling and output of 1–2 Ml/kg/h is usually targeted in the peri and postoperative periods through an appropriate fluid therapy. Mild hypervolemia reduces sympathetic vascular tone leading to dilation of the flap vessels. It has been noted that an increase of 2 cm H2O in central venous pressure above the baseline can double the cardiac output and produce skin and muscle vasodilatation. However in certain scenarios, it becomes a necessity to give vasopressor to maintain acceptable mean blood pressure. In patients undergoing the head-and-neck cancer resection and free flap reconstruction, spectral analysis of laser Doppler blood flow signals has demonstrated denervation of free flaps. It was shown that with use of norepinephrine, control of blood flow shifted toward low frequency vasomotion where blood flow depended mostly on an average blood pressure. Therefore, it was concluded that noradrenaline could be considered as the most suitable agent following free flap reconstructive surgeries of the head-and-neck malignancy patients. It has been observed that noradrenaline increases free flap skin blood flow more when compared to other vasopressors, making it the most suitable pressor agent during hypotension in patients undergoing free flap microvascular reconstructive surgeries following resection of the head-and-neck cancer. Noradrenaline is indicated for the emergency restoration of blood pressure in cases of acute hypotension. It acts on both alpha-1 and alpha-2 adrenergic receptors to cause vasoconstriction and thereby increasing blood pressure. The starting dose is 0.025 μg/kg/min. In a retrospective review by Kelly et al., on the impact of intraoperative vasopressor use in free tissue transfer during the head, neck, and extremity reconstruction, it was found that the frequency of vasopressor use was 53.2% with no significant difference in flap outcome in patients who received vasopressors and those who did not. Another randomized controlled trial in patients undergoing ablative and reconstructive head-and-neck surgery with microvascular flap also showed noradrenaline to be safe and effective for use in the postoperative period when used to maintain MAP between 80 and 90 mmHg. In the study, normovolemia was maintained and flap perfusion was monitored with continuous tissue partial pressure of oxygen and microdialysate metabolite (lactate-to-pyruvate ratio) measurements. The present study essentially draws the same conclusion as the above mentioned studies in stating that the use of noradrenaline to maintain adequate peri-operative MAP does not adversely affect the outcome of the free flap. Fang and Liu concluded that intraoperative use of phenylephrine, ephedrine, or calcium chloride as an intravenous bolus does not increase flap compromise and failure rates in cancer patients. The effect of dobutamine on blood flow of free tissue transfer flaps during the head-and-neck reconstructive surgery was assessed. It was concluded that both mean and maximum blood flows were increased significantly in the anastomosed artery at dobutamine infusions of 4 and 6/μg/kg/min which was accompanied by increased cardiac output and improved free flap perfusion. The intra-operative use of vasopressors ephedrine, phenylephrine or both, was found to be safe in free jejunal free flap reconstruction surgeries for reconstruction of circumferential pharyngeal defects created after resection of cancers of the hypopharynx. The common causes of flap failure are multifactorial such as arterial (arterial thrombosis, vasospasm), venous (venous thrombosis, vasospasm, mechanical compression), flap edema (excessive use of crystalloids, excessive hemodilution), generalized vasoconstriction (hypothermia, pain, respiratory alkalosis), hypotension (hypovolemia, use of myocardial depressants), and prolonged ischemia of the flap. The most common cause for flap loss is venous thrombosis followed by arterial obstruction. The majority of flap failures occur within the first 48 h. With early detection and re-exploration, salvage is possible with success rates ranging from 28% to 90%. Our retrospective analysis revealed almost similar reasons for re-exploration in both groups. During re-explorations thrombus in arteries and veins were removed, additional arterial and/or venous anastomoses were performed if required, and hematomas, if present were evacuated. Incidence of re-explorations was more in patients with anterolateral thigh free flap, probably because they were bulkier flaps as compared to free radial forearm flaps. High incidence of re-exploration in Group N could be secondary to hypotension impeding flap perfusion. In the present study, Group N patients had significantly lower preoperative hemoglobin levels as compared to Group C, which could be one of the reasons for the development of intraoperative hypotension. The distribution of patients with higher ASA physical status was also found in Group N compared to Group C (39% vs. 11%). The presence of comorbidities such as uncontrolled hypertension, diabetes, and ischemic heart disease might have resulted in a compromised cardiovascular system which predisposed these patients to intraoperative hypotension. It has been shown that patients in ASA physical status class 3 or more is a predictor of hypotension during anesthesia. Another finding was that Group N patients were more hypothermic intraoperatively which could have been a contributory factor for the development of hypotension. It has been shown that those with higher preoperative systolic blood pressures have lesser chance of development of intraoperative hypothermia. In the present study, patients in Group C had higher systolic blood pressure in the beginning. Systolic blood pressure in Group N was found to be significantly low. The reason for higher requirement of colloids, packed red cells, and fresh frozen plasma in Group N can be explained by the presence of hypotension due to various reasons and subsequent attempts at correcting it. Lower heart rate in Group N despite hypotension could be secondary to use of noradrenaline to correct hypotension, intraoperative analgesia with morphine and use of clonidine in some cases to control hypertension during resection of tumor. However, both pre- and post-operative hydration were comparable in both groups as evidenced by comparable blood urea levels. Hypotension did not affect renal function postoperatively as serum creatinine and electrolytes remained in the normal range in both groups. The major drawbacks of the study were that surgical causes for flap hypoperfusion were not analyzed and the study population varied widely with respect to factors such as preoperative hemoglobin levels, types of free flap, and hemodynamics. Number of patients in both the two groups were not equal as patients who required vasoconstrictors intraoperatively during the study period was less compared to those who did not require it. As results of any study need to be extrapolated to a larger population, our study with a small sample size in the group which received noradrenaline cannot be considered to provide a very conclusive result. Although patients who required multiple vasopressors were excluded, there was no standardization for the dose of noradrenaline. The doses used varied from 0.02 to 2 μg/kg/min. Influence of other compounding factors affecting flap outcome were not separately analyzed. Due to the complex nature of the procedure, numerous factors actually combine to determine the success rate following free flap surgery. Perioperative use of noradrenaline to maintain blood pressure did not adversely affect free flap survival in patients who underwent the head-and-neck reconstructive surgeries. Although re-exploration rate was marginally increased with use of noradrenaline, the final flap outcome was unaffected. Vyas K, Wong L. Intraoperative management of free flaps: Current practice. Ann Plast Surg 2014;72:S220-3. Pushparaj S, Boyce H, Chisholm D. Anesthetic consideration in a postchemotherapy pediatric patient for segmental mandibulectomy with free fibula reconstruction. Curr Anaesth Crit Care 2009;20:18-21. Stepanovs J, Ozoliòa A, Rovîte V, Mamaja B, Vanags I. Factors affecting the risk of free flap failure in microvascular surgery. Proc Latvian Acad Sci Sec B 2016;70:356-64. Quinlan J. Anaesthesia for reconstrutive surgery. Anaesth Intensive Care 2006;7:31-5. Eley KA, Young JD, Watt-Smith SR. Power spectral analysis of the effects of epinephrine, norepinephrine, dobutamine and dopexamine on microcirculation following free tissue transfer. Microsurgery 2013;33:275-81. Eley KA, Young JD, Watt-Smith SR. Epinephrine, norepinephrine, dobutamine, and dopexamine effects on free flap skin blood flow. Plast Reconstr Surg 2012;130:564-70. Kelly DA, Reynolds M, Crantford C, Pestana IA. Impact of intraoperative vasopressor use in free tissue transfer for head, neck, and extremity reconstruction. Ann Plast Surg 2014;72:S135-8. Raittinen L, Kääriäinen MT, Lopez JF, Pukander J, Laranne J. The effect of norepinephrine and dopamine on radial forearm flap partial tissue oxygen pressure and microdialysate metabolite measurements: A randomized controlled trial. Plast Reconstr Surg 2016;137:1016e-23e. Fang L, Liu J, Yu C, Hanasono MM, Zheng G, Yu P, et al. Intraoperative use of vasopressors does not increase the risk of free flap compromise and failure in cancer patients. Ann Surg 2018;268:379-84. Scholz A, Pugh S, Fardy M, Shafik M, Hall JE. The effect of dobutamine on blood flow of free tissue transfer flaps during head and neck reconstructive surgery. Anaesthesia 2009;64:1089-93. Chan JY, Chow VL, Liu LH. Safety of intra-operative vasopressor in free jejunal flap reconstruction. Microsurgery 2013;33:358-61. Adams J, Charlton P. Anesthesia for microvascular free tissue transfer. Br J Anaesth (CEPD Reviews) 2003;3:33-7. Novakovic D, Patel RS, Goldstein DP, Gullane PJ. Salvage of failed free flaps used in head and neck reconstruction. Head Neck Oncol 2009;1:33. Lonjaret L, Lairez O, Minville V, Geeraerts T. Optimal perioperative management of arterial blood pressure. Integr Blood Press Control 2014;7:49-59. Kasai T, Hirose M, Matsukawa T, Takamata A, Kimura M, Tanaka Y, et al. Preoperative blood pressure and intraoperative hypothermia during lower abdominal surgery. Acta Anaesthesiol Scand 2001;45:1028-31.